Growing up in the late 90's, I loved Space Jam. I remember watching that movie every single week with my friends and loving it from beginning to end. I wasn't even a fan of basketball but I just loved watching the Looney Toons be themselves in a feature film. Nowadays, I still have a warm, fuzzy feeling watching Space Jam, even if it has a lot of issues and nearly all of the classic Looney Toons characters are acting way out of character. But I've surprisingly been looking forward to Space Jam 2 since it looks like to be the exact same movie, but for this generation. Swap out Michael Jordan with LeBron James, give it some slicker animation, and you have a surefire hit on your hands. Today we got our first teaser for the movie, which is slated to begin production in 2019. And... it's a locker room. A very nice locker room, but still a locker room. 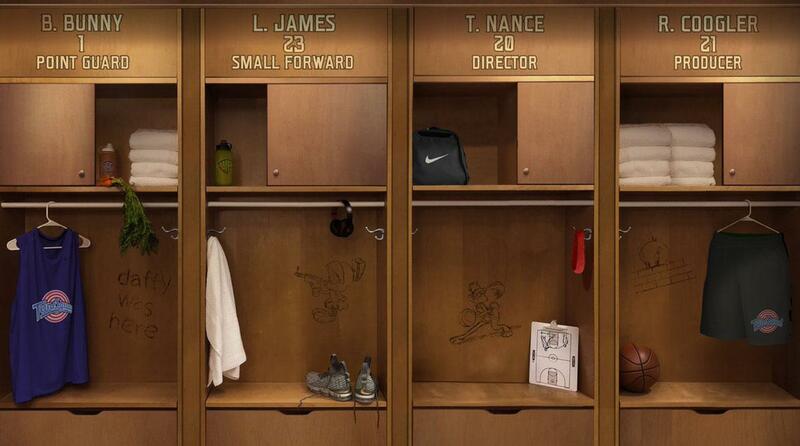 We see name tags for the LeBron, director Terence Nance, who directed the TV show Random Acts of Flyness, and Bugs Bunny, but the biggest surprise is that Ryan Coogler is going to be producing the movie. As in, Black Panther Ryan Coogler. Count me in! The only thing that would make me happier if we had confirmation that we'd be seeing the modern, insane Lola instead of the sexed up version of her in the original film. Also, random question, but can you imagine if Shaq was the star of the original Space Jam and not Michael Jordan? What kind of movie would that have been?